Blog — Alpha Gamma Lambda Chapter Alpha Phi Alpha Fraternity Inc. The sweet sounds of jazz filled the room as Bro. Chip Shelton and his Peacetime Band soothed the crowd at the Harlem Alphas’ “Jazz Happening” Fundraiser. The initiative supports the chapter’s Go To High School, Go To College National Program entitled Young Achievers, which since 1998 in partnership with Links Inc., provides mentorship and college preparation to local high school students who come from communities in the Bronx and Harlem. At the fundraiser, there was a great turnout and at one point standing room only as locals and the Brothers of Alpha Gamma Lambda Chapter was able to raise over $2,000 for this year’s students. The chapter’s Director of Education, Bro. Victor Perkins, a Spring 2013 initiate, was elated with the outcome and said he expects great things from this year’s program. “It’s always good to see the brothers of Alpha get together along with the community and see a noble cause come to fruition for these young people that need our help,” Perkins said. Two days after a successful fundraiser, The Young Achievers Program held their orientation for its students. This year’s catchy theme, “I AM Y.A.” was repeated throughout the festive gathering, something Perkins said these students should remember and take pride in the fact that they can follow in the footsteps of some of the program’s successful alumni who are away at various colleges. In the crowd, were some familiar faces who are now seniors in high school and there were many young new ones as they were accompanied by school counselors and interested parents. Over 40 students attended the orientation, which is almost triple the number from last year’s program. Students were introduced to what Young Achievers were and how they too would be helped to become successful. They also had the opportunity to eat and fellowship with counselors, potential mentors and brothers of the Harlem Alphas. The Young Achievers Program was featured on the local airwaves of WHCR 90.3 FM, The Voice of Harlem, as Bros. Victor Perkins and Mohamad Doumbouya were guest spreading the word about Young Achievers and the “I AM Y.A.” movement. On the show, they talked about the state of young black males in Harlem and where the Young Achievers Program fits in the bigger picture. There is a need for mentors and if you are interested in joining the “I AM Y.A.” movement, you are encouraged to reach out to Bros. Antonio Alston or Bryan Braswell, the Young Achievers Mentor Advisors. Be sure to join the Harlem Alphas and Its Young Achievers at their next joint session as they will discuss The Importance of Safety when dealing with the NYPD and Dressing for Success. This session will be held at Harlem Hospital RM6101, on Tuesday, November 26, 2013 at 6:30PM We Look forward to you joining us! If you are a young male, between the ages of 12 & 18, and what to participate in this program please respond to Brother Victor Perkins @ vperkins@harlemalphas.org for more information. Presidential elections, an impending mayoral race, and a number of sticky local politic issues – it must be campaign season. It is, and the brothers of Alpha Gamma Lambda have been taking tremendous strides to ensure an informed citizenry in Harlem. 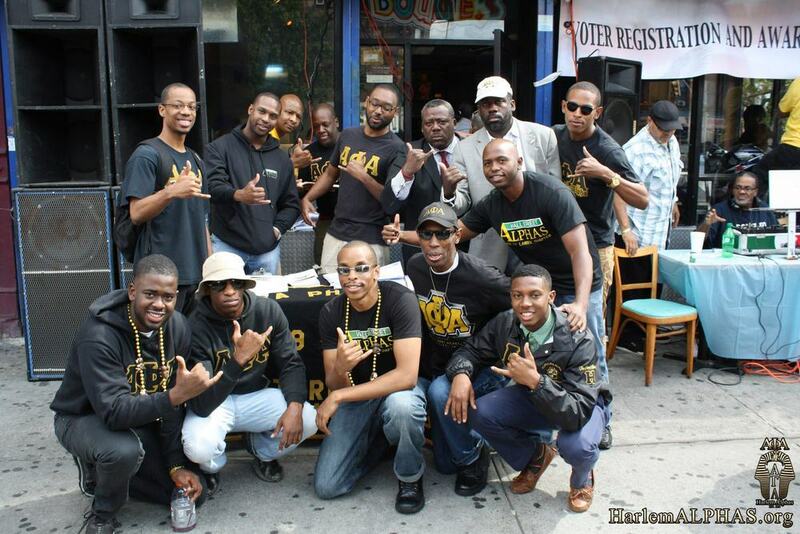 This summer ended with Alpha Gamma Lambda’s “Voter Registration Trifecta”, which was a series of voter registration drives at different events in the Harlem community. Starting with Harlem Week’s “Block Party” and ending with the African American Day parade, the brothers represented the Black and OLD gold very well. Brothers walked around with clip boards registering people on the spot and our very own DJ Blackmon (and program chairman) played some of that sweet soul-stepping music that got everyone moving. The music, the heat and our voter registration cards made for a grand time in Harlem. Moreover, the brothers took it a step further and developed a nonpartisan voter resource guide that presented President Obama and Governor Romney’s views on housing, education, healthcare, and the economy. The guide was not only passed out at the events but is available for download on the Harlem Alphas website. The guide is the first step in a “Presidential Insights” online discussion that is ongoing until Election Day. “First of All We Vote” was certainly championed in New York City and at the helm was the brothers of Alpha Gamma Lambda chapter – “Alpha’s Great Legacy.” Onward. Be sure to check out the pictures from the event here. On a warm summer night in August, the brothers of Alpha Phi Alpha Fraternity Inc., Alpha Gamma Lambda chapter successfully hosted their inaugural roll bounce event. The Riverbank State Park in Harlem was covered in Black and OLD gold as the brothers and their guests rolled around the rink in one of the hottest events of the summer. Two DJS rocked out for hours to some of the old school roll bounce songs and the latest hits. Of course we couldn’t leave without an electric slide, cupid shuffle or wobble…on skates, and in the middle of the rink, that is. All we needed was some afro wigs, bell bottoms and multicolor shirts and you wouldn’t be able to tell us that we weren’t the resurgence of the Roll Bounce days of the 1970s and 80s. Some people were naturals, you know the type that twirl around the rink and backwards skate with minimal effort, others not so much – unless holding on for dear life as they scooted around the rink counts, and some fell (a lot) but we won’t count that. Members of the National Pan Hellenic Council and a couple of Harlem based community organizations had a blast CHILLIN with the Harlem Alphas and we are looking forward to keeping the party going with some highly anticipated events this fall and next spring. All in All, Riverbank State Park was effectively frozen despite it being one of the hottest nights of the summer. By Corey Matthews, Associate Editor to the Sphinx Flushing, NY - It was June 1, 2012. 7pm at Terrace on the Park. The brothers of Alpha Gamma Lambda, the oldest alumni chapter in NYACOA, brought together family, friends and brothers from far and wide to celebrate their 85th chapter anniversary in true Alpha Phi Alpha fashion – a black tie affair. At about eight thirty, the chapter president and hosts asked that everyone quiet down to begin the formal program that would acknowledge four dynamic leaders in the Harlem community and share a bit of information about Alpha Gamma Lambda chapter. After the welcome and brief outline of the night’s program, there was of course invocation and yes you guessed it the “Black National Anthem.” Fortunately, the programs provided everyone with the words to the song – after that cocktail hour and the open bar no one really remembers anything after “Till Victory is Won.” For dinner, the guests were met with an Italian and seafood buffet, a salad bar and later a full dessert area. As guests ate and talked with one another brothers couldn’t resist the urge to take pictures outside near the ice sculpture that was custom designed for this memorable evening. Did I mention that the penthouse overlooked the city skyline? There was an entire patio area that invited brothers and guests to have a drink on the bar, socialize and take pictures against the backdrop of the breathtaking New York City. From the deck you could see everything from the Empire state building to the New York Times building, and all of the other world-renowned New York City skyscrapers. The guests were taken aback by the view, the gentle breeze and of course the flowing cocktails, it was perfect. Following dinner and with Alpha spirit filling the room, the brothers took the liberty of providing a brief overview of Alpha Phi Alpha history. The brothers started with the founding on an ICE COLD Tuesday December 4, 1906 by the 7 Jewels, the aims, motto, national programs and a nice wrap up about our increasingly important and relevant purpose in the community. This presentation was succeeded by an equally riveting presentation of the history of Alpha Gamma Lambda chapter in New York City and the work that’s been done with several community based organizations, schools and political officials to uplift the Harlem community. Guests were pleased to hear that prominent officials such as Charles B. Rangel (U.S. Congressman), David Dinkins (106th Mayor of New York City), and Rev. Dr. Adam Clayton Powell Jr. (U.S. Congressman and Civil Rights Activist) held membership in the historic chapter that was formerly known as Alpha Psi before its named changed to Alpha Gamma Lambda. Guests and brothers were equally excited to know that Jewels Eugene Kinckle Jones and Vertner Woodson Tandy served in the chapter after it was formed as well. Now that the formalities of Alpha Phi Alpha history were properly presented and received, it was time to celebrate the four honorees who have been strongholds in Alpha Gamma Lambda’s success. Barbara Martin received the James Avery Community Service award for her work at the Harlem Hospital and Bronx Community College. She is also a member of Alpha Kappa Alpha and has mentored several AGL brothers from youth – a true gem in the community. Next, Dr. Peter R. Barbatis received the Paul Robeson Lifetime Achievement Award for his longstanding education career and great impact at the Bronx Community College of the City of New York. Angela C. Butler, Basileus of Alpha Kappa Alpha Pi Kappa Omega Chapter (Harlem AKAs) received the Adam Clayton Powell, Jr. Visionary Leadership Award for her work in community development and childhood education. Finally, our very own brother Erik A. Cliette received the Marshall E. Williams Distinguished Leadership Award for his life long commitment to the Harlem community. He’s served as a four-term president of the Alpha Gamma Lambda chapter and is an educational advocate, author and mentor. Alpha Gamma Lambda couldn’t select a better set of honorees to highlight this night as their guests knew how to get down once the music turned on and the program ended! Thus, the brothers of Alpha Gamma Lambda were introduced, and all brothers were invited to sing the Alpha Sweetheart song and Alpha Hymn to formerly conclude the program. (insert picture of brothers singing) Once the music dropped, brothers and guests danced the night away. As people left they received a parting gift bag on their way out to thank them for celebrating this festive evening and moment in history with the brotherhood. By Corey Matthews, Associate Editor to the Sphinx Harlem, NY - In May, the brothers of Alpha Gamma Lambda chapter kicked Go to High School, Go to College in late sixteenth century-style with its inaugural “Harlem Shakespearean Sonnet Slam.” The oldest alumni chapter in New York State boldly represented its Black and Old Gold in the center of 125th street, directly in front of the Adam Clayton Powell Jr., State Office building. Alpha men, members of other NPHC organizations and community members alike worked together to promote literacy to the Harlem community and its adventurous tourists. With a DJ, a stage and the enthusiasm of a bustling 125th street, Alpha Gamma Lambda showed that reading is fun and built confidence in its audience who eventually joined brothers on the stage and tried their hand at reading a few sonnets. They picked up passersbys, youth with their parents, college students on summer break and even a few Malcolm X commemoration protesters – all in a great community-building and literacy awareness event.